I’ll admit it: I’m a vampire-story junkie. Ever since I read Anne Rice’s 1976 novel Interview with a Vampire, I’ve been thirsting—shall we say—for more. So, you can see why I was “sucked in” to watching The Vampire Diaries series on TV, ever since it premiered in 2009. But the other night while viewing a recent episode, I couldn’t help noticing all the close-up camera angles on the brand names of the props—on cars, computers and cell phones—that appeared in the show. In fact, one lingering shot of the Ford logo on the trunk of an automobile didn’t even make sense for inclusion in the story line. As a former script analyst who worked in Hollywood for film and TV production companies, I can tell you that such scenes in programs didn’t use to happen with such regularity. Those types of jarring shots got me thinking about all of the product placements that now bombard us every day. I’m not saying that such blatant advertising—outside of paid-for commercials—in the media is new. It’s been going on for some time now. And when it comes to adventure and adventure sports, there’s really nothing “novel” about it. But I think we’ve come to a new threshold, and I’m not quite sure it’s a good idea to step over it. Because I think there’s a difference between planning an adventure with advertising backing and using an adventure to promote products. 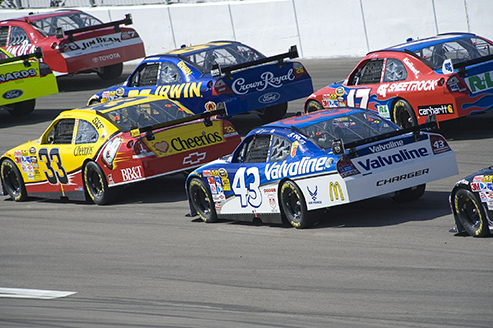 NASCAR racing has a long history of sponsorship. When adventurer Steve Fossett landed his hot-air balloon in the Australian Outback on July 4, 2002, he became the first person in the world to complete a circumnavigation of the globe in such a craft. He accomplished the feat in just under 15 days. Of course, his adventure was the source of a lot of media coverage. 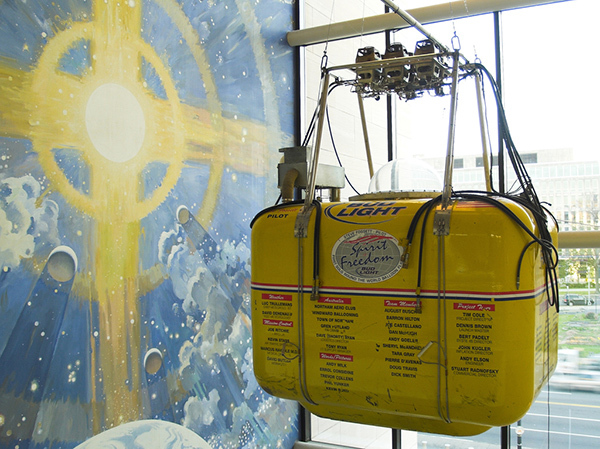 In visuals of the event, the name of his historic airship is prominently displayed: the Bud Light Spirit of Freedom balloon. When Plastiki adventurer David de Rothschild set about calling the world’s attention to the damage plastic is doing to our oceans, he set up a website where he could regularly blog about his exploits en route. His technology partner was Hewlett-Packard, his global satellite communications partner was Inmarsat and one of his expedition suppliers was Kiehl’s. I know this because these names are in a banner across the bottom of the site. NASCAR drivers have long worn jumpsuits plastered with ads, of course, and mountain climbing expeditions have a long history of sponsorship by equipment suppliers. Of note, is The North Face’s sponsorship of the Pioneer Climbing Expedition—the first team of African-American men planning to undertake the challenge of climbing the world’s Seven Summits (Denali, Aconcagua, Kilimanjaro, Everest, Kosciusko, Vinson and Elbrus). Adventures are expensive, after all, and we can’t fault those who take risks from raising the money needed to pursue them. 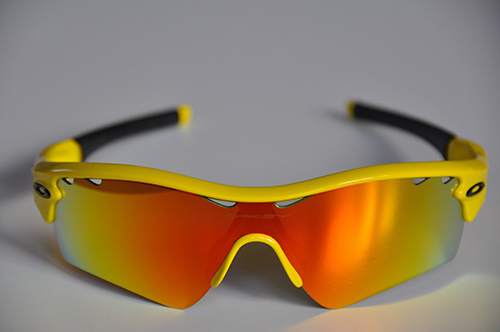 When the Chilean miners emerged, they were sporting Oakleys. I don’t doubt that the miners had to wear something to protect their eyes. What I do wonder about is the need for them to be sent such distinctive pairs, of the great media attention to it and the ads that ensued. Maybe those funny, foldable, paper-and-plastic dark glasses you get from your eye doctor—the kind handed to you after you get drops in your eyes—would have sufficed. I like the way you think. I was confused with the Vampire lead in. Had the Chilean miners become Vampires? Tainted by the demons of the darkness, in need of cool sunglasses because of their Vampireness? Why shouldn’t we expect to see product advertisement in are news stories? We have already surrendered to paying for T.V. programing and we still have to sit thru numerous commercials. How much of a hour program is actually entertainment time versus advertisement time, not to mention product placement in the program? I’m OK with advertising and sponsorships being tied to products, events and activities, as long as it’s subtle and tasteful. If it’s not, a negative image of the companies and their products is created. Here are my somewhat related thoughts on product placement. There are plenty of restaurants with a low overhead that I love. I certainly don’t look down on them for using the Pepsi-sponsored sign for their entrance. After being in a touring band, I was more than happy to put up the sponsor flags in exchange for free sticks, strings, and repairs. On the other hand, I was as disgusted with the miners’ sunglasses as I would have been if they came above ground slamming bags of Doritos.